Companion tools for Jan's Fast2Cut Fussy Cutter 45-degree diamond rulers. Used for Kaleidoscopes, Harbor Lights, stack-cut octagonal Kaleidoscopic designs and more. This ruler set has been used in Jan's Indian Summer quilt, Dancing African Ladies quilt, Harbor Lights, and others. Quilters, rejoice! Fans of the Quick Star Quilts book, and the easy classic Star-in-a-Circle designs now have a specially designed wedge tool for quick rotary cutting. Click the image for more details. Cut accurate shapes for the Stone Mosaic quilt! 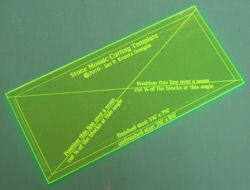 The fluorescent acrylic tool is easy to see on all fabrics! Includes both 3" + 6.5" Fussy Cutter Guides. Click the image (left) for more details.